How ironic such an inversion of reason should come out of a school principal. The state school system relies on redistribution of wealth. The poorest school gets double the funding of the richest school. The 'rich' are robbed to pay the 'poor'. "It seems that we're robbing the poor to pay the rich," said Mr Gall, who is also president of the Secondary Principals Association. That's plain wrong. What kind of lesson does it teach to young minds? No wonder we are experiencing an epidemic of entitlement. Most New Zealanders, it would appear, are prepared to live with some degree of socialism. But let's at least have it properly understood, and honestly and accurately represented. Family Intervention Projects is the latest UK initiative to try and improve the lives of children living in families where crime and violence are not uncommon. I did a little further searching and found some information about the types of families in the programme. No surprises. 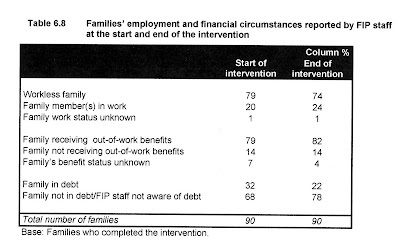 69 percent were headed by a lone parent and 61 percent were receiving out-of-work benefits. Products of the modern welfare state. 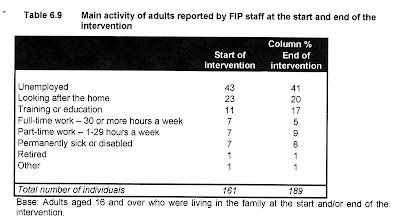 The early results from those families that have completed the intervention show some improvement - more so for children - better school attendance, less anti-social behaviour orders received, less trouble with housing authorities, improved health. Interestingly this mirrors the Christchurch EarlyStart programme which is improving outcomes for children but not for adults to the same degree. And are the families less state-dependent? Barely. His Act colleague Sir Roger Douglas used his 90 per cent discount to fly himself and his wife to Britain to visit family, but Mr Hide scoffed at claims from former MPs that it should remain. "If you're an ex-MP and you've got the perk, of course you'd love it. But it was another time in New Zealand. "It's hard to believe we ever did that, but that's how things used to operate. There were always perks in doing jobs and now there aren't perks. "That goes right across New Zealand, and Parliament should be the same," Mr Hide said. Claims the travel subsidy was part of the employment package at the time and compensation for accepting lower salaries were rubbish, he said. This is pure, unadulterated, put'em up Hide. It is also damage control. Douglas' attitude towards his perks has detracted badly from ACT's core ethic. Hide's workload is doubled by not just having to work to build support but work to hang on to it. "You better keep paying your taxes". Excuse me waiter, is that the calories or the price? Apparently United States legislators want restaurants to start menu detailing of calorie counts on their meals. This is another pointless and expensive federal proposal that will lead to cookie-cutter menus and will actually retard our incentive to think for ourselves. Do politicians really think that people don't know that a salad has fewer calories than a cheeseburger? And how long will it be before this asinine idea comes to a country near you? Why are the proposed emission reductions benchmarked to 1990 levels, almost 20 years ago? Why won't the husband and wife directors of KidsCan disclose their self-awarded salaries? Will Sir Roger Douglas be joining the 'Hands off our perks' campaign? How big is Adolf's sample? So even if you had decided not to support the weekend's telethon because you prefer to support other causes, because you believe that more handouts only create more dependency, that kind Mr Key decided he would do it for you. As sure as unspeyed cats will have kittens another child will be assaulted and killed. There is nothing new to say about the rate of child death due to intentional injury. I wonder if the referendum papers were on the bench of her home waiting to be filled in? Daisy has gone into labour under the desk. Poor little thing. I think that's it. One tabby, one black and white and one black. Uh oh. Wrong. After mother appeared to settle down to rest another black one popped out. Running late on time. No, the second black is actually a dark tabby.